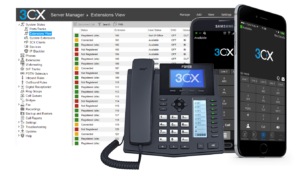 3CX Phone System is a software based PBX that works with SIP standard based IP Phones, SIP trunks and VoIP Gateways to provide a full PBX solution – without the inflated cost and management headaches of an ‘old style’ PBX. Used by more than 30,000 companies globally, 3CX has been recognized for its innovation and cutting-edge technology. 3CX is easily installed and managed and is preconfigured to work with popular IP Phones, VoIP Gateways and SIP trunks saving you the hassle of having to configure and manage these devices. As a certified 3CX partner, trust SME Tech to deliver your on-premise or hosted 3CX service.